Wireworld Chroma 6 review | What Hi-Fi? 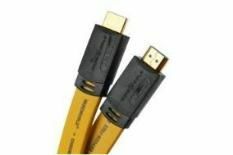 If, at first glance, this violently yellow Wireworld HDMI provokes feelings of déjà vu you'd be forgiven, seeing as it closely resembles the Chroma 5, which we tested back in July 2007. Reassuringly solidly built, and stylishly flat like a jaundiced tapeworm, the Chroma 6 has the added attraction of, yes, you guessed it, full 1.4 capability and accompanying high-speed and Ethernet tags. But does waving the 1.4 wand over a cable work wonders? Bearing in mind the four star Chroma 5 was susceptible to noise and lacked some stability, the answer must be a resounding ‘yes' because in the Chroma 6, Wireworld has produced a masterpiece. Given the snaking opening sequence of The Shining, the Chroma 6 offers rock steady motion and almost total lack of unwanted noise as we track Jack Torrance's Beetle around the mountains. Wendy/Walter Carlos's imposing score fares well too, with this HDMI's firm, wide sound that incorporates a taut bass and well-integrated treble and mid-range. All this would be fine on its own, but where this Wireworld shines is with pin sharp images and a realistic palette where skin tones are reassuringly natural and colours are well defined and in balance. In short, you'd be hard-pressed to find a better HDMI cable around that has this kind of ability for the money. There's little of note here to detract from the Chroma 6, and a long list of plus points in its favour. It's a no-brainer really, and this HDMI shouldn't just be on your audition list, it should be in your pocket too.